As a part of the ‘Masters at Work. 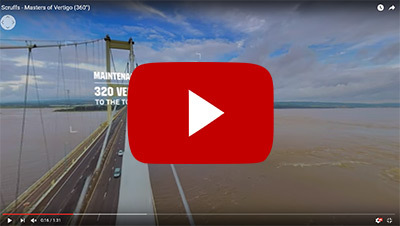 Masters of Workwear’ campaign, Scruffs has teamed up veteran engineers of the Severn Bridge between England and Wales in the short film ‘Masters of Vertigo’. As an industry first, the 360° video captures first hand the team’s ascent of over 400 feet, battling against the Great British weather to carry out vital maintenance work. This includes helicopter footage demonstrating the vast scale of the task at hand. 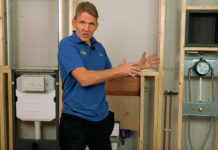 Scruffs is a workwear brand that champions tradespeople and appreciates the expertise, dedication and hard work that often goes unseen. The maintenance team featured in the video have over 500 climbs between them and a combined experience of 26 years. The one mile long bridge reaches a height of 445 feet at its peak, which takes 320 vertical steps to reach.